Researchers at the International Maize and Wheat Improvement Center (CIMMYT) analysed potential trade-offs in maize residue use as soil mulch and livestock feed in mixed crop-livestock systems in Kenya. Based on survey data, researchers found that both the proportion and quantity of maize residue used for soil mulch and livestock feed are strongly affected by agro-ecology and livestock holding. Farmer knowledge about alternative use of crop residues and farmer perception of soil erosion risk positively affect the amount of residue farmers retain on maize plots. Results imply that crop residue use as soil mulch in conservation agriculture is challenged in mixed crop-livestock systems and particularly by smallholder farmers owning cross-bred and exotic dairy animals. In general, reducing the demand for crop residues as livestock feed through the introduction of alternative feed sources, better extension services on the use of crop residue as soil mulch and designing agro-ecology specific strategies and interventions could facilitate the adoption and expansion of CA-based practices in mixed crop-livestock systems. This week Nature discusses about increasing food production in Sub-Saharan Africa by using fertilizer (supported by subsidies) or by implementing more sustainable ways such as conservation agriculture, “fertilizer trees” and legumes. The Editorial concludes that “For now, that has to mean improved access to fertilizers, because the choice between food and famine is an easy one”. Maybe the opportunities are in combining both approaches, depending on the farm/local conditions and socio-economic and biophysical context. 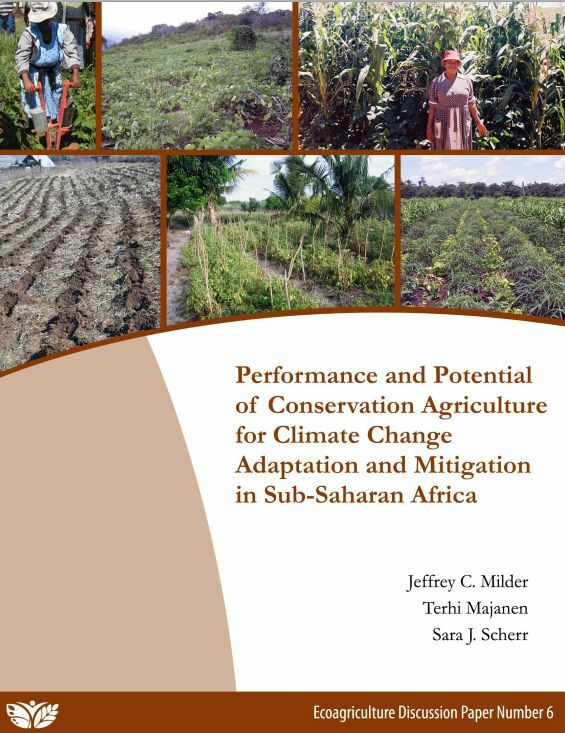 This Discussion Paper published by EcoAgriculture Partners with support from CARE and WWF-US examines how Conservation Agriculture (CA) might support climate change adaptation and mitigation in the context of smallholder agriculture in sub-Saharan Africa. It also defines and analyzes a broader approach to CA—including natural resource management and support for human and social capital at the farm, village, and landscape scales—that may increase synergies between food production, ecosystem services, and climate change adaptation. The study concludes by suggesting ways in which new policy priorities and climate finance sources may support the scaling-up of CA in appropriate contexts throughout sub-Saharan Africa, following the mainstreaming of CA that occurred in the Americas in prior decades. “SLP Southern Africa presented the first results of the SLP-Southern Africa regional case study at the 10th African Crop Science Society Conference, 10-13 October 2011 in Maputo. Elizabeth Bandason, Bunda College Malawi, illustrated the special case of mixed crop livestock systems and crop residue uses in Mzimba district, Northern Malawi. Sabine Homann-Kee Tui, ICRISAT Zimbabwe, used comparative farming systems analysis to illustrate the different stages of crop livestock intensification at the project sites in Mozambique, Malawi and Zimbabwe and to determine site specific entry points for interventions. Mixed crop-livestock systems in semi-arid southern Africa are a function of the interplay between agro-ecological conditions, human population densities, local and national drivers: The sites in Zimbabwe and Mozambique show a strong growth potential in livestock; markets need to be improved to enhance impact; interventions in Malawi can learn from this. The Malawian case shows that investment in agricultural inputs pays off; government support can kick-start this. Livestock production and market development can lead to greater crop-livestock integration and cross-subsidization, sustainable intensification. Development programs should take recognizance of mixed farming systems in the context of local and national drivers, and align interventions with those factors as well as with farmers’ aspirations and resource endowments”.